Janice Luke Loo is President of the Takitani Foundation and a co-chair of the Legacy and Community Scholarship committees. She received her B.A. in English and Education from Skidmore College, holds Masters degrees in English and Education from Stanford University, and received a Klingenstein Fellowship from Teacher’s College, Columbia University to develop innovative approaches to high school curriculums. 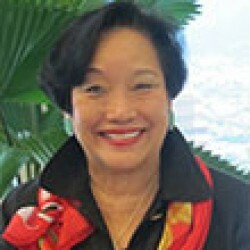 She is currently on the board of Care Resources Hawaii, REHAB Hospital of the Pacific, is a Commissioner with the Hawaii State Supreme Court Commission on Judicial Conduct, Vice-Chair of REHAB Hospital Foundation, and serves on the Wo International Center Advisory Board at Punahou School.